According to an 80+ year Harvard University study, the chief predictor of health and longevity is strong human relationships. When you can’t hear well, you miss out on the conversation. Over time, you may avoid talking with others due to embarrassment. Hearing aids are essential to maintaining healthy interactions with family and friends and maintaining an active lifestyle. With recent technological improvements, hearing aids are almost invisible. If you’ve been diagnosed with hearing loss and require hearing aids to improve your hearing, you may be wondering about the cost and if financial assistance is available. Below, we’ve listed some ways you can pay for a hearing aid. The short answer is no but hearing exams might be. If you’re covered by original Medicare (Part A and Part B) and you decided to get your hearing checked on your own or buy a hearing aid on your own, you will pay 100 percent of the cost of routine hearing exams and hearing aids. However, if your physician or healthcare provider orders a diagnostic hearing exam and believes you have a medical condition that requires treatment, Medicare Part B may cover 80 percent of the cost of exams and tests (not hearing aids). Unfortunately, hearing aids are not covered under any circumstances. I have Medicare Advantage insurance. Will it help with the cost of hearing aids? Possibly. Diagnostic hearing and balance tests deemed medically necessary may be covered by your Medicare Advantage plan. But not all Medicare Advantage plans (HMOs and PPOs) cover hearing aids and routine hearing care, so it’s important to choose your Medicare Advantage plan wisely. For the best savings, use an in-network physician or audiologist to lower out-of-pocket costs. Remember – copays, coinsurance, and yearly limits may apply. Important reminder: a Medicare Advantage plan usually requires a separate monthly premium which is in addition to your Part B monthly premium. I’m a veteran. 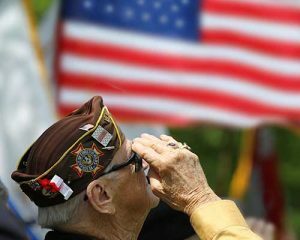 Will the VA help with the cost of hearing aids? A veteran with any paying service-connected disability. A permanently housebound veteran that requires regular aid and attendance, and who qualifies for an increased pension. A veteran with a hearing impairment resulting from a disease or other medical condition for which they are receiving care or services from the VA.
A veteran with significant functional or cognitive impairment – a deficiency in his/her ability to perform the necessary day-to-day activities of living. A veteran with a hearing impairment severe enough that it interferes with his ability to participate in his medical treatment actively. If you haven’t already done so, you need to register with the VA before you can receive hearing aids. You will need to show your Veteran’s DD214 and driver’s license, and your insurance card if you have medical coverage. You can register in person at a VA Medical facility, by mailing a completed and signed Form 10-10EZ to a VA Medical Center, or register online by clicking the Apply for Health Benefits button on the VA benefits application page. Once you receive confirmation that you are registered, make an appointment with an audiologist at a VA clinic or medical center. If you need hearing aids, you will not pay for them or repairs or batteries as long as you maintain your VA eligibility for care. Sertoma is a service organization that provides a list of organizations, by state, which helps disadvantaged individuals with obtaining hearing aids. Sertoma’s non-profit program, SHARP (Sertoma Hearing Aid Recycling Program) is funded by Sertoma civic clubs located nationwide. SHARP accepts hearing aid donations and recycles the devices to provide hearing aids to low-income individuals. A one-time fee is required. The National Hearing Aid Project is a collaborative effort offered by the Hearing Charities of America (HCOA). The National Hearing Aid Project addresses the need for hearing aids, for low-income people, nationwide. The project combines several organizations across the U.S. to fulfill the need for hearing aids. HCOA works with the University of Kansas to refurbish and track all hearing aids used in the program. After you complete the application process and are accepted into the program, you will receive hearing aids. Follow-up evaluations, fittings, and services complete the process. Hear Now is an application-based program sponsored by the Starkey Hearing Foundation. This program provides hearing assistance to Americans with limited income. Hear Now fits each accepted patient with new, digital hearing aids customized to their needs. Hear Now is made possible through the generous donation of time and services of audiologists and health professionals nationwide. Can I Pay for Hearing Aids with an FSA or HSA account? Yes, contributions to most Flexible Spending Accounts (FSA) and all Health Savings Accounts (HSA) cover hearing aids and hearing aid batteries. An FSA enables you to set aside pre-tax dollars used to pay medical expenses not covered by your insurance plan, but if you don’t use your account balance over the year, you forfeit the funds. An FSA is not an option if you are retired since employers offer these plans as a benefit. An HSA works similar to a savings account allowing you to set aside money on a pre-tax basis to pay for medical expenses such as copays, deductibles, and coinsurance and your account balance rolls over year after year. You use an HSA along with a high-deductible health plan to lower your out-of-pocket costs. Healthcare.gov defines a high-deductible health plan as any health plan with a deductible of at least $1,350 for an individual or $2,700 for a family. HSA funds usually roll over to the next year. For further information regarding hearing aids and FSAs and HSAs, see IRS Publication 502 for details on acceptable hearing aid or other medical expense you can pay for using either an FSA or HSA.